It was cloudy today in Shirahama. 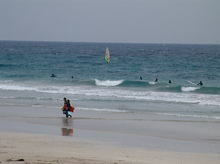 When I wento to the beach there were some people on the beachside and surfers in the sea. Today it was sunny in the morning but after that cloudy all the afternoon. I think that I want to see always the shinning sun and blue sea in Shimoda. The weather forcast says that it would be cloudy and rainny tomorrow. But after that we would be able to see warm and sunny day. This entry was posted in beach on 2006年2月19日 by izusakuraya.